adamjgale, Author at Vertical Specialties Inc.
To say that Rencontre East is isolated is somewhat of an unclear statement by today’s standards. A short time ago, this was much of Newfoundland and Labrador and since many towns have voted for and accepted government relocation programs. 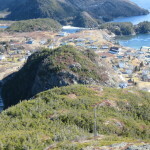 Remote communities still exist throughout the coastal regions of Newfoundland and Labrador. They are few and the last of the true Newfoundlander and Labradorean people which tourists really come to see. 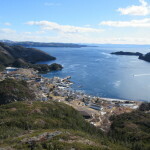 If you want to see the absolute real province then you need to visit these communities. Luckily, as a tower company, we get to see a lot of these communities as there are often microwave links to provide service to these small towns. 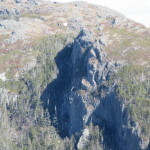 They are often located on mountaintops near the town with harsh, rugged and dangerous terrain and approaches to get to them. 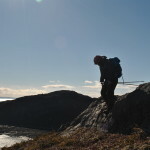 This environment provides a unique approach and risk assessment to ensure we access these locations safely yet timely. This often means engaging locals to give you information that you won’t find using topographical or satellite information. They are few and some of the last of the true Newfoundlander and Labradorean people which tourists really come to see. On our recent excursion to Rencontre East to assess a tower structure for a new linkup, the experience was more than expected. The ferry service would have us left in the town for a couple of days with no other exit and limited communication. We packed to limit the amount of gear we would need and jumped on the ferry in Bay L’Argent for a two hour coastal run to Rencontre East. We couldn’t see much as it was late in the day and this is winter of course. Arriving on the dock around 7:00 PM, the ferry is greeted by more than a few of the locals who are waiting with ATVs and trailers to pick-up family members and other wares purchased or those delivered by the ferry. As we hand hauled our gear off the ferry it seemed that within only minutes the crowd had dispersed and everyone was already home. The townspeople are used to this of course and deal with this like clockwork. There are no automobiles in this town; ATVs are the mode of transport to get around the small dirt roads of the town. 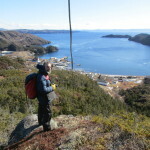 We hand hauled our gear a short distance to the “Blue House” owned by a Newfoundlander who has acquired a few properties in Rencontre East as vacation rentals. 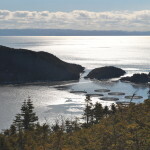 These rentals can be found at www.rentneartheocean.ca. Thanks to Paul’s place, we were more than comfortable with the fully setup accommodations. Despite being mid-February, Walter and I woke up to what you could only describe as the perfect working conditions (especially for a hike up a mountain). Early in the morning it was already hovering around 0°C with clear blue skies and virtually no snow. The temperatures were set to rise and with very little wind we set to climb the mountain. An existing TX pole line clearly indicated the way and old trails were faintly visible. 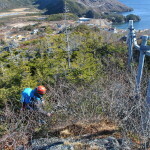 It didn’t take long to reach the summit and the tower so we could begin our work. The work didn’t take a lot of time as the structure is only 52 ft in height and all the existing infrastructure is at the bottom of the mountain. 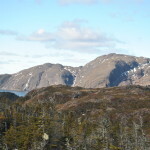 Normally a site like this in the vicinity of the St. John’s would only take a couple of hours. This location would take three days including travel. Despite the work objective, the scenery was amazing. 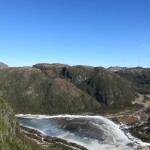 From this location we were treated to hovering Bald Eagles, a view of the bay, the salmon farm, Little Harbour (including a large waterfall), the town of Rencontre East, and rugged mountains and terrain as far as the eye can see. In perfect conditions, there is little else that you can really ask for. Eventually, as time really was not a huge factor at this point, we traced the TX line back down the mountain to assess it for viability of new TX. Back at the “Blue House” we unloaded and repacked our gear and ate lunch. We walked the town and looked at the area and met some locals to discuss the “goings on” of the town. We gleaned some understanding of the local economy and what it is like during tourist season and what the locals do here. Perhaps most interesting is that the locals go further inland on a lake in the summer to their small cabins to get away. 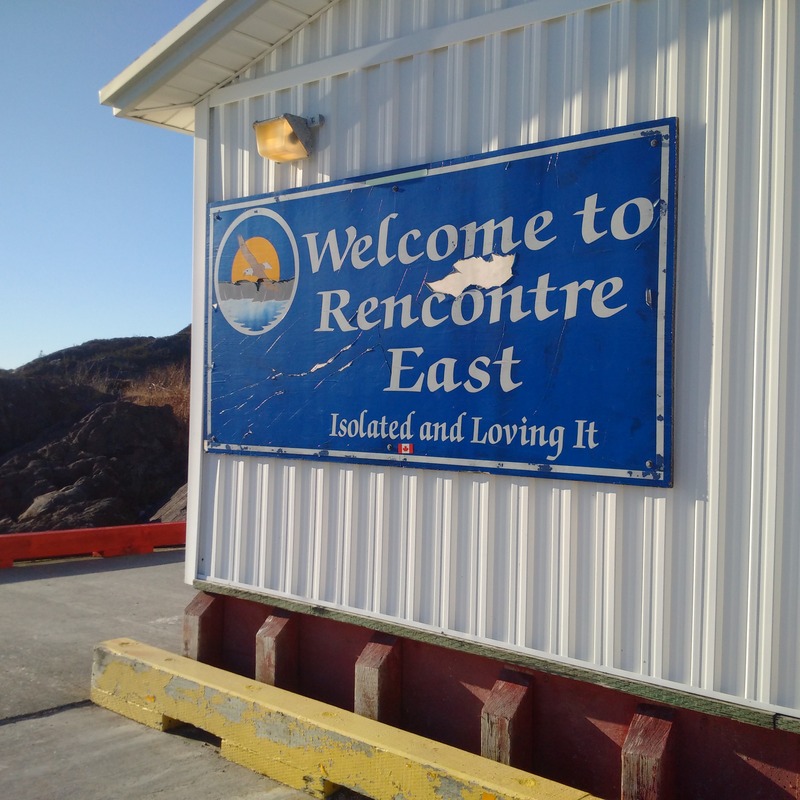 This pleasantly amused us, even though I myself am from a small town, that the people of Rencontre East would feel a need to “get away” from what the rest of us already consider getting away from it all. Having our fill of fresh air and some small sight seeing, we finished our packing and some energy replenishment to get some rest for an early Ferry at 7:00 AM.